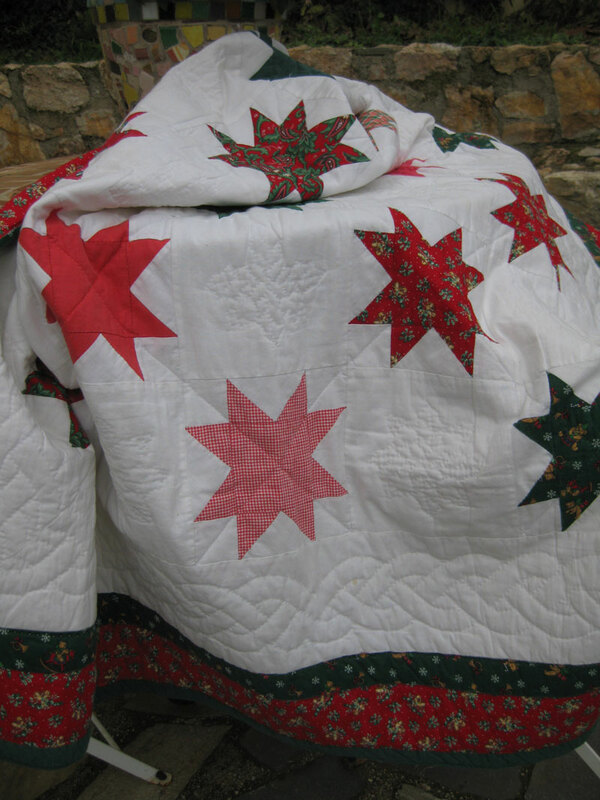 When I entered a quilting group about twenty years ago, everyone was working on an Eight Point Star quilt. They showed me how to proceed, and I did my first quilt using this pattern. With the enthusiasm of the beginner I finished it quickly and started at once a second one with the same pattern : this Christmas lap quilt. It is hand pieced and hand quilted. Every Christmas since twenty years I enjoy taking it out from the closet and display it on a sofa. What a treasure this quilt is! 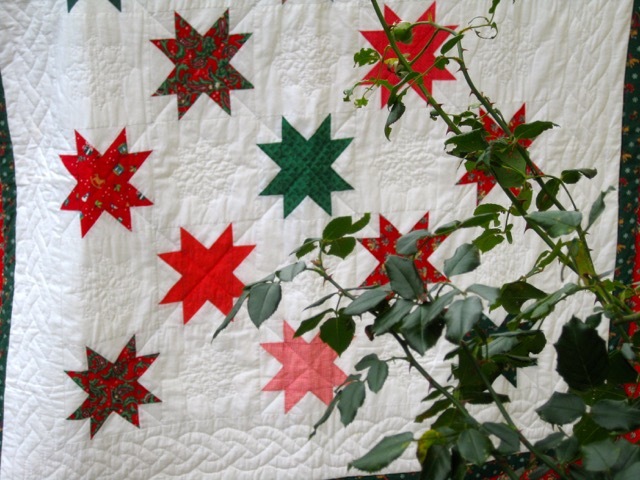 I love the fabrics you used in the stars and all that hand quilting is impressive for a beginner quilter! Your photography makes it even more special. Love the way placed it on the door with the wreath! You are so creative. Thanks for sharing! This is a beautiful family heirloom to display each Christmas. 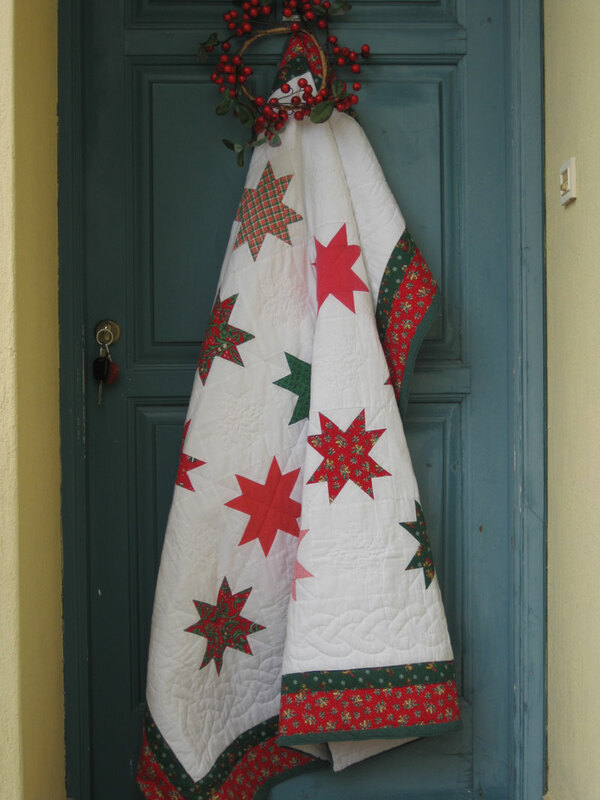 I agree with Diane, your hand quilting is impressive and I love the way you have displayed it on the door. The perfect quilt to have out on display each Christmas. It is very pretty and I love that it was hand-pieced and hand-quilted. Beautiful! Both of them, just beautiful!! Dans ce beau quilt pour Noël !! Je tape trop vite !!!! O... Wonderful... such beautiful and sweet stars :o)) and quilting sstiches too !! What a beautiful treasure. I especially love the braid (I think that's what it's called) quilting just inside the border. Looks like it was fun to do! Hanging on the door with the wreath and the keys...what a welcome! I so enjoy your posts. Merry Christmas! A charming quilt, Christine and lots of memories are wrapped up in it for you, too! What a beautiful treasure ... I'm sure you look forward to that part of your Christmas decorating. Your quilt is so striking! I'm trying to get up the courage to try hand quilting. Yours is elegant and beautiful. Such a beautiful post and quilt!! I'd love to highlight this for our upcoming Tuesday Archives linky as our theme this coming week will be:Christmas. Drop me an email and let me know. Merry Christmas to you and your readers!! Your quilt is very pretty. I love taking out my hand-made items year after year. What beautiful memories. Gorgeous! I love the quilted cable! It is beautiful. Even then, your tasteful use of fabrics shows. Happy holidays to you and yours! What could be more perfect? 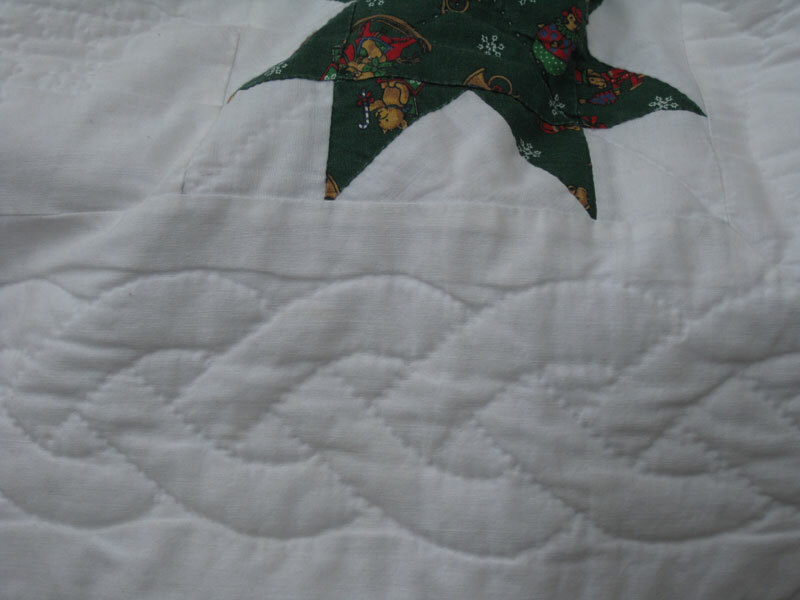 Fond memories and a gorgeous Christmas star quilt! Wishing you and yours a very Merry Christmas! Beautiful quilt and wonderful post! Happy Holidays! 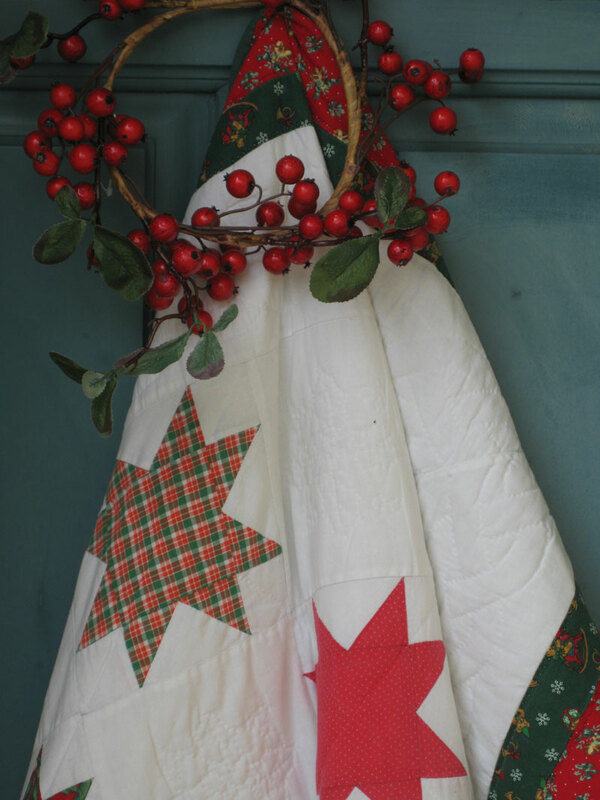 So lovely with the different fabrics and the alternate quilted stars. Oh how lovely, you just can't beat red green and stars for Christmas! I adore it! The hand quilting is wonderful. Such a lovely quilt; the hand-quilting is excellent! I love the look of hand quilting, and yours is superb! What a beautiful Christmas quilt...I'm sure it will be cherished for generations to come. What a charming reminder of where and how you started out in quilting, I just love this. And the quilt is a beauty too. Have a marvelous 2015! How lovely! Nice to have seasonal quilty treats like that! Thanks for sharing! This is so pretty and hand quilted too - wowsa! What a love quilt! 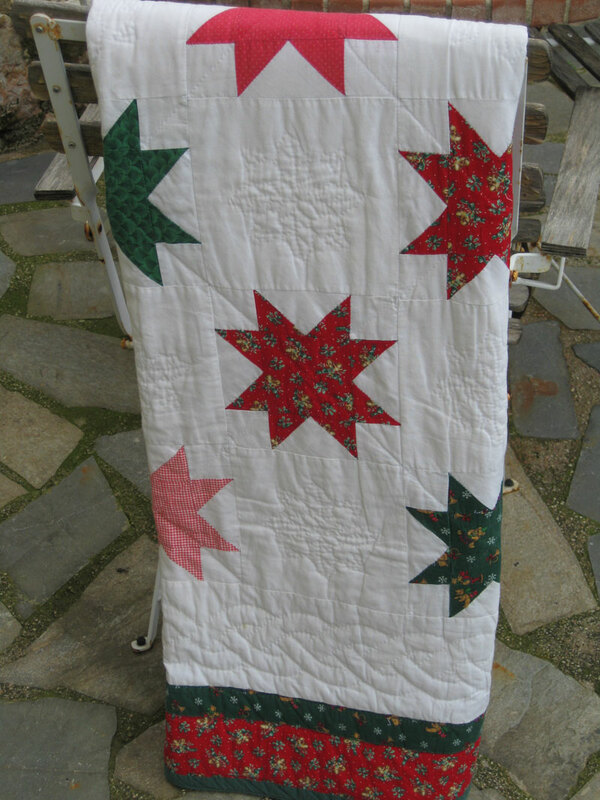 The quilting adds a nice detail, and the stars are so simple, but beautiful. What a great Christmas quilt! I like the effect of the mostly red, but variety of fabrics. Thank you for sharing such a lovely, loved quilt.